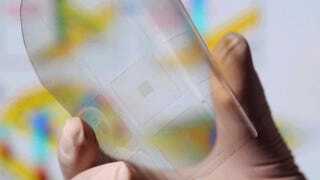 By using a nano-sized 3D array, scientists have created "smart skin" that accurately mimics the sense of touch. It could eventually be used in robotics, human-computer interfaces, and advanced prosthetic devices. To make it work, a research team led by Zhong Lin Wang from Georgia Tech built tiny arrays made up of around 8,000 transistors. These transistors were bundled together with nanoscale crystals of zinc oxide, a semiconducting material. Called taxels, these transistors have piezoelectric properties, which means they can independently produce electronic signals when subjected to mechanical force, like touch. Indeed the smart skin exhibits a sensitivity comparable to that of a human fingertip. The breakthrough is a 15-fold improvement in sensor density and spatial resolution compared to previous approaches. High-resolution images also showed a dramatic improvement in sensitivity — about two to three times better than previous efforts. One limitation of the technique is that it only works in materials that have both piezoelectric and semiconducting properties. What’s more, the researchers need to integrate the smart skin into a system that can interpret the signals and respond accordingly. But once these challenges are met, the technology could endow robots and assistive devices with a human-like sense of touch.